Look fabulous in this beautiful navy blue long prom dress with mock two-piece styling. The lovely blue dress has a sheer band at the midriff that gives the illusion of a trendy two-piece gown. Like a garden of wildflowers, the high-neck bodice has a multi-colored embroidered floral design that wraps around to the back. A matching band of colorful flowers and greenery adorns the natural waistline of the navy blue long chiffon skirt. 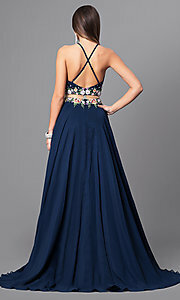 Thin spaghetti straps criss cross over the open back and adjust for a comfortable fit on this elegant formal dress. Under $200 for prom or formals, this mock two-piece navy blue long prom dress blossoms with figure-flattering glamor at an affordable price. The model is 5'7.5" and wearing 6" heels. 64", Hollow to Hem 62"